A home spa is one of the most versatile investments you can make for your home and your health! From personal relaxation and hydrotherapy to gathering your family and friends, a hot tub creates your own private backyard oasis. Add a hot tub to your pool or outdoor entertainment area for the perfect family relaxation spot. Or tuck it snugly into the corner of your patio to create the ultimate personal escape. At Zagers, we proudly carry Jacuzzi, Dimension One, and Mira Spas. Each brand offers its own unique benefits and designs, so you’re bound to find the hot tub that will help you unwind just the way you want. With all of the options available, it’s easy to get overwhelmed when you start shopping for a new home spa. Sizes, shapes, seating, jets, and exterior finishes are just a few of the features that will influence your decision. Just here to get your feet wet? We invite you to step on in! Whether you start by browsing our brands or learning more with our Buyer's Guide, we can help you select the perfect hot tub at the perfect price. If you’re ready to see our selection for yourself, stop by a Zagers Spa Showcase. Compare hot tubs up close and personal, with the personal service you need to make a great choice. Our professionals know the right questions to ask to determine your needs, with the expert insight to help you choose wisely. We feature spa showcases at four of our five West Michigan locations. Visit the Dimension One showcase in Grand Rapids (Fuller Ave), and our Jacuzzi and Mira showcases in Holland, Jamestown, and Grand Rapids (Shaffer Ave). How do you plan to use a hot tub? How many people will use it at once? Which type of seat do you prefer? Where in your body do you carry stress? How long do you want to own your spa? Still have questions? Don’t Worry. We Can Help! 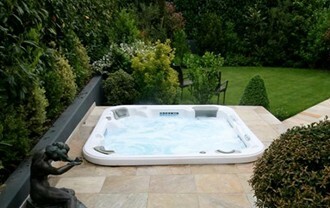 Helping you pick the perfect hot tub is one of our specialties! We encourage you to stop into one of our locations, contact us with your questions, or request a quote online. You can also find resources on our blog, and see what specials we are currently offering. We are West Michigan’s exclusive dealer of Jacuzzi, Dimension One and Mira with locations in Grand Rapids, Holland, and Jamestown.